The Salvation Army is a registered charity under the Charities Act 2005, registered number CC37312. This means The Salvation Army is exempt from income tax. The Army also has Donee Status from IRD, meaning donations of $5 or more may qualify for a tax credit. Those interested in becoming Salvation Army members can explore becoming a senior soldier or an adherent member. Children eight years of age and older are able to become junior soldiers. Senior soldiers are Christians of at least 14 years of age who (with local approval) have been enrolled as a member of The Salvation Army after signing the Soldier's Covenant. 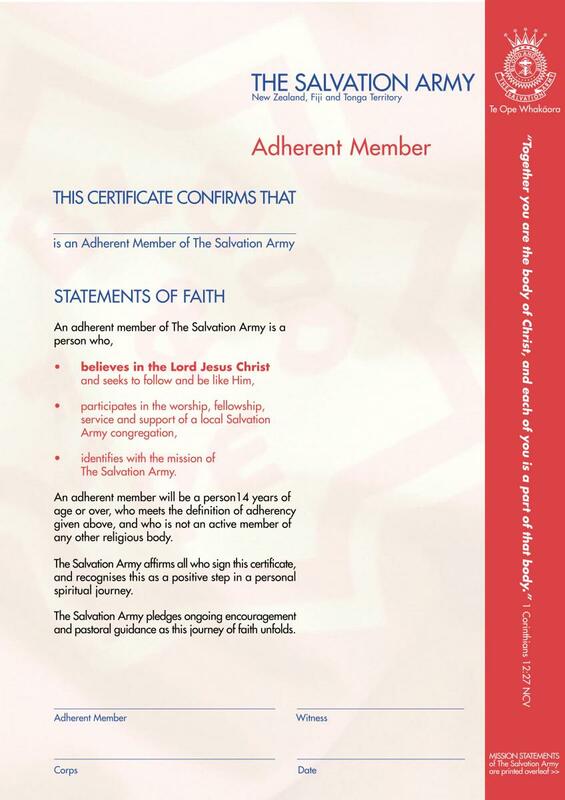 Adherent members are Christians over 14 years of age who also want to make The Salvation Army their church home. An adherent makes particular statements of faith, but does not make the promises listed in the Soldier's Covenant.